This is our Reception, and the starting point of your walk through time. Our staff are always welcoming and happy to introduce you to our exhibits. From the Reception, move into the Thomas Lord Room. Its our tribute to Thomas Lord, of Lords Cricket Ground fame. 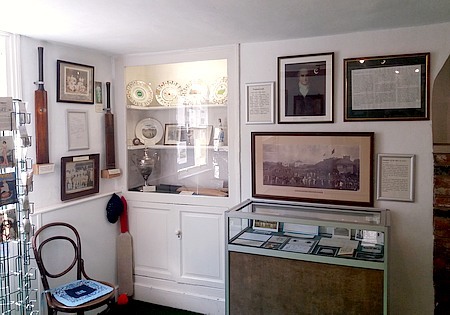 You will see displays of cricket memorabilia. Discover the legend behind one of Thirsks most intriguing artefacts: the Busby Stoop Chair, cursed by Thomas Busby in 1702. 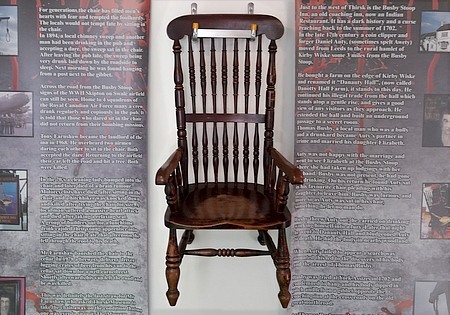 Read how a dispute between a local forger and a drunkard spiralled into murder and a curse placed upon this chair. 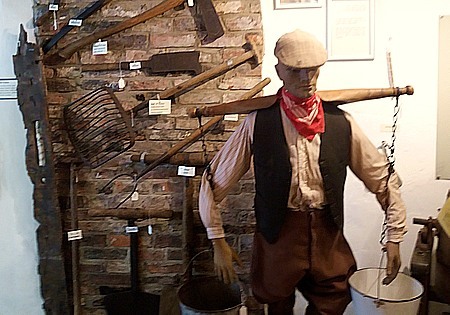 Evoking the farming life of the 1930s and 40s, this room contains agricultural and dairy tools, a collection of antique animal traps and a display of the blacksmiths craft. A special exhibition follows the rise and fall of Bamletts, the agricultural engineering firm synonymous with Thirsk for over a century. With its stone sink and cast-iron range, this is where the 19th-century housewife spent her time washing, cleaning and cooking. The kitchen has a variety of household utensils once in daily use. See our collection of photographs of floods throughout Thirsks history. As you head upstairs you will see our original wartime plaques from Wings for Victory week. Do take the time to read about the Drovers road, crossing the Hambleton Hills. 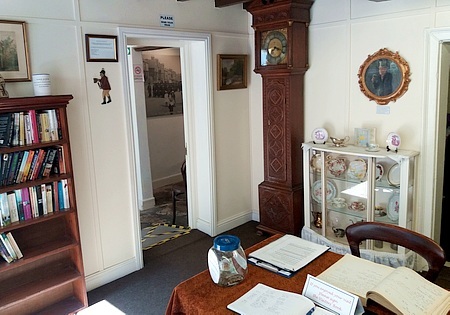 Moving on from the stairs, come and see our many artefacts collected from Thirsks history. See the toys, some of which were made by Italian prisoners-of-war who were held in North Yorkshire between 1940-45. There is a display of the history of the Falcon Masonic Lodge number 1416. Stationed in Thirsk from 1943, the Canadians of No. 433 Squadron flew night bombing missions over France and Germany, operating Handley Page Halifax and Avro Lancaster bombers. After the war they transported troops back to the UK and POWs back to Italy. Here you can learn about local war hero William Stephenson. In 1914 he joined the Cheshire Regiment, but later served in the Royal Logistics Corps. He was killed in an air raid in Flanders, while recovering from wounds received during the Hundred Days Offensive in 1918. Read about how William Feather emigrated with his family to New Zealand, and their journey from the Vale of Mowbray to the Bay of Plenty in the 1800s. The Feather family maintained long-lasting ties with Thrisk, which are kept alive by our Museum. 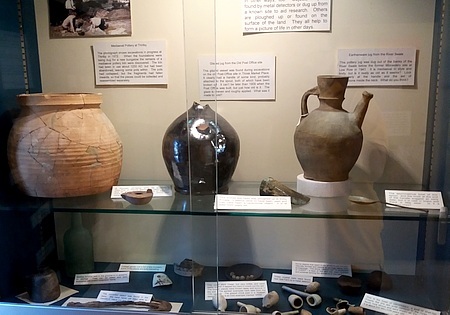 Here you will find interesting artefacts excavated in and around Thirsk, including Edwardian coins, Medieval pottery, clay pipes, Civil War era musket balls, Anglo-Saxon gravestones, Stone Age arrowheads and items from the Neolithic period. Discover Thirsks ancient history, including its castle. 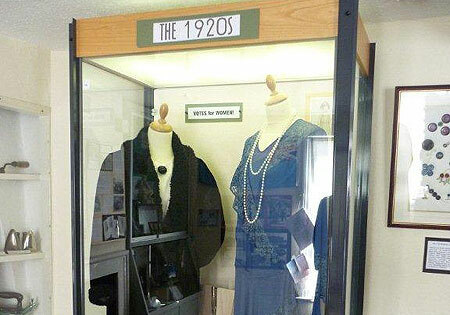 Step back in time to the beginning of the 20th century. The fireside is surrounded by cabinets of fine china, intricate needlework and other treasures. 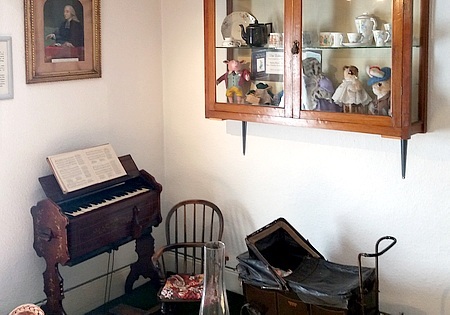 The room also contains a range of furniture, pictures, curios, a sewing machine and a harmonium. A traditional iron and brass bed is covered by a patchwork bedspread, originally from a maids bedroom in Thirsk Hall. Freshly laundered undergarments are laid out ready to wear. Your journey through time begins here. The Reception contains several exhibits including a plaque carved in the workshops of Robert Thompson, the famous Mouseman of Kilburn. You can find books, postcards and tourist information here too. Cricket fans can see a portrait of Thomas Lord presented by the MCC, a copy of his only known surviving signature, and a number of items connected with Yorkshire cricket and Yorkshire players. There are maps, drawings and photographs tracing the changes in Thirsk over the last 200 years. Here you will also find one of our best-known exhibits: the Busby Stoop Chair. Thomas Busby, coiner and drunkard, murdered his father-in-law Daniel Auty in 1702. He was arrested, tried and condemned to death by hanging. After his execution, his corpse was suspended in chains from a gibbet erected at the lonely crossroads where an inn stood nearby. The inn later became known as the Busby Stoop Inn, taking its name from the stoop or post on which his remains could be seen. The place was said to be haunted by his ghost, and a chair at the inn gained a sinister reputation. Wartime bomber pilots thought it unlucky to sit there, and in the 1970s some fatal accidents were linked with the chair. In 1978 the landlord asked for the chair to be removed to the Museum, and hung out of harms way. The Busby Stoop Chair has not been sat on since. 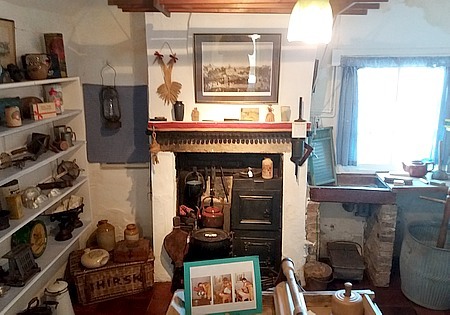 Evoking the farming life of the 1930s and 1940s, this room contains agricultural and dairy tools, together with a display of the blacksmiths craft. 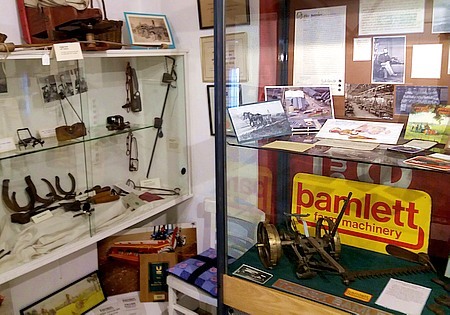 A special exhibition follows the rise and fall of Bamletts, the agricultural engineering firm synonymous with Thirsk for over a century. A series of illustrative panels traces the development of farming in the Vale of Mowbray and explains the processes of butter- and cheese-making. With its stone sink, cast-iron range and linen hanging above to air, this is where the 19th century housewife spent her time washing, cleaning and cooking. The kitchen has a variety of household utensils once in daily use, including an early washing machine and a heavy mangle. 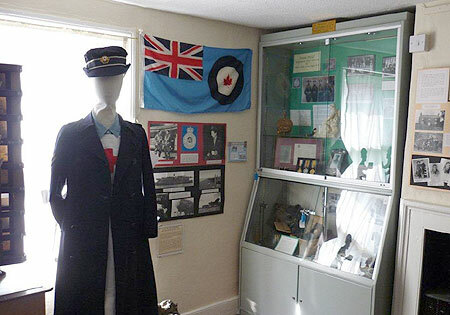 Make your way up the stairs to discover collections of toys and childhood possessions, items reflecting the experiences of two World Wars, and photographs telling of the lives and fortunes of local families. Also on display are the Flappers in the 20s and the Scandinavian Red Cross Nurse in her outdoor uniform. Among the displays are The Office - ledgers, writing equipment and stationery from the 19th and early 20th centuries; The Music Shop - wind-up gramophones and 78rpm records from the 1920s and 30s; and Lace - examples of lace-making in a variety of styles. 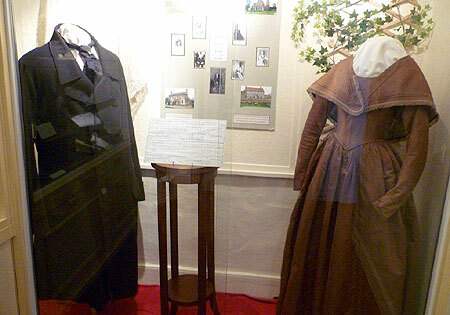 See the coat and wedding dress of Thomas Smith and Elizabeth Fawcett at Thirkleby Church in 1841. Step back in time to the beginning of the 20th century. The fireside is surrounded by cabinets of fine china, intricate needlework and other treasures. Furniture, a sewing machine, a harmonium, pictures, books and curios complete the scene. A traditional iron and brass bed is covered by a patchwork bedspread originally from a maids bedroom in Thirsk Hall. The bedspread was made in the 1890s and bears the embroidered names of many local families of the time. 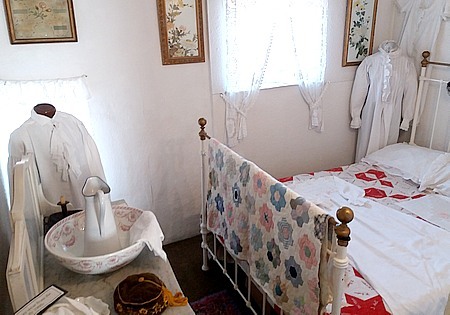 Facing the bed are a table, jug and washbasin, while freshly-laundered undergarments are laid out ready to wear. See ceramics, coins, jewellery and tools found by archaeologists around Thirsk. Among the exhibits are the remains of the Saxon Giant recovered from an ancient burial ground near the Museum. This room is named after Bernard Reynolds who converted it for the Museums use. These bones from the early Saxon period (around the sixth century) were found during excavations at Castle Garth in the 1990s. Analysis of the bones showed that they belonged to a man who stood nearly seven feet tall. He lived at a time when the average height was less than it is today, making him a giant among his contemporaries. Normally these exhibits are covered, but visitors can see them simply by raising the cover.